To keep the sugar maple tree compact and healthy, prune every year. While most trees benefit from pruning in the early spring once frost danger has passed, sugar maple trees bleed a sticky sap if pruned during this time. Gardeners who want to avoid this sap can wait until the tree has leafed out in late spring to prune their sugar maple. 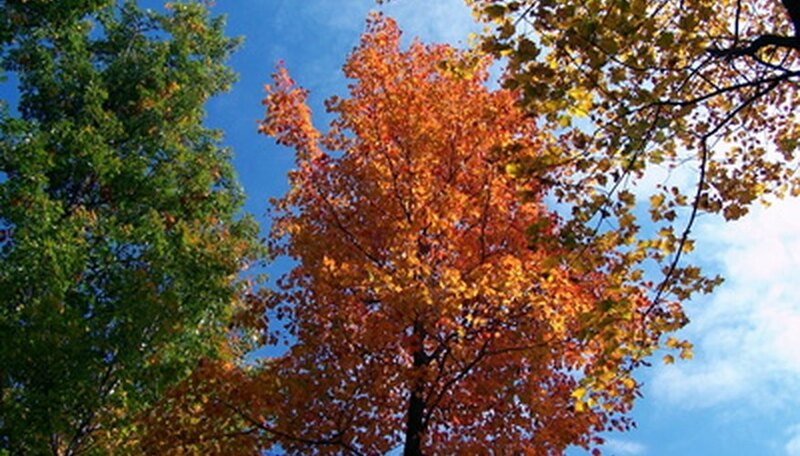 Sugar maples average 50 to 80 feet, so gardeners with large trees may wish to hire a tree pruning service. Locate any dead, diseased or damaged branches on your sugar maple tree. Diseased and damaged branches are often discolored, scarred, wounded or otherwise affected. Deadwood is hollow to the touch and doesn't move with the wind. Remove this material for the health of your sugar maple tree. Remove the unhealthy wood by cutting it off at the base. If only the tip of the wood is damaged, prune back to a Y-intersection instead. Don't cut into the trunk collar, or into the swollen tissue where the base of the branch hits the trunk. In between cuts, spray your pruners with disinfectant spray to prevent the disease from affecting healthy limbs. Trim away any suckers that grow from the tree trunk or out of old pruning cuts. Suckers can also grow out of Y-intersections. They are fast growing and leafy, and they sap energy from the sugar maple. Cut away low-hanging branches that impede movement under your sugar maple. Also strip off branches that grow downward, those that crisscross other wood, and those that grow vertically. Pruning these removes some shade from the canopy and allows for better air circulation, which can help your sugar maple resist succumbing to disease. Trim back existing branches by several inches if you feel they are too long. Cut the branches back with your pruners to an offshoot. Use lopping shears for cuts larger than 3/4 inch in diameter and anvil pruners for smaller cuts. Use the hand saw for large limbs. When & Trim Citrus Trees in Southern California?